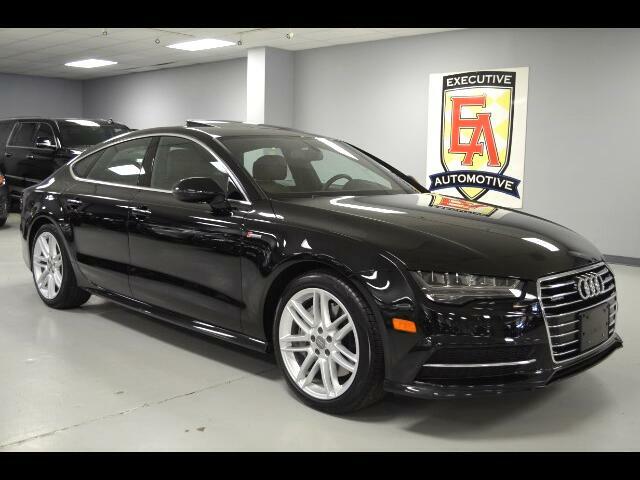 2016 Audi A7 3.0T Premium Plus Quattro Mythos Black Metallic with Nougat Brown Leather ONLY 18K MILES Options Include: S LINE SPORT PACKAGE (19 Inch 7-Double Spoke Galvano Silver, S Line Exterior, Sport Suspension), COLD WEATHER PACKAGE (Heated Rear Seats, Heated Steering Wheel), HEATED FRONT SEATS, BLUETOOTH WITH BOSE AUDIO, SMART KEY ACCESS WITH PUSH BUTTON START, POWER GLASS MOONROOF, NAVIGATION SYSTEM WITH BACK UP CAMERA, PARKING ASSIST, XM SATELLITE RADIO. Contact Kyle Porter at 816-616-2500 or email kyle@executiveautomotive.com for additional information. Thanks for your interest in our Audi!